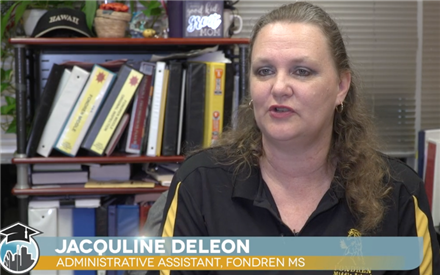 Welcome to a wonderful 2018-2019 school year at Fondren Middle School. It is with extreme gratitude that I serve the students, parents, and community of Fondren Middle School. Each day we will strive to build strong relationships that will lead to the ultimate goal of student success. Our excellent team of educators are ready to meet the needs of individual students and to challenge and motivate them. We are excited about the awesome learning opportunities for students as we work diligently to ensure their social, emotional and academic growth. At Fondren, young minds are being developed to excel and to be productive citizens in our changing society. Fondren Students Have Changed a Life! Fondren students help change lives through fundraising activities and partnering with the We Help Two organization. Funky socks change lives! HISD recognized Fondren Middle School Administrative Assistant Jacquline DeLeon as the district's employee of the month for November 2018. Things to know about the upcoming school year.